Hmmm, I wonder what is outside this door? Dum de dum doodle dee dee, nice day for a walk! I might not be quite ready to head downstairs in the elevator by myself. Yet. I think you are very brave, Daisy! Now you just need to hop on a plane and come and see ME!! I just had a vision of you getting all dolled up to go out shopping, getting in the elevator and asking someone to press the Lobby button for you. Oh, wait. I think you can reach it yourself. But you might need help hailing a cab. Oh Daisy, please be careful. That looks a little scary but kind of fun. Loved your song as you were walking. Hope all of you have a great day. Take care. WOW! 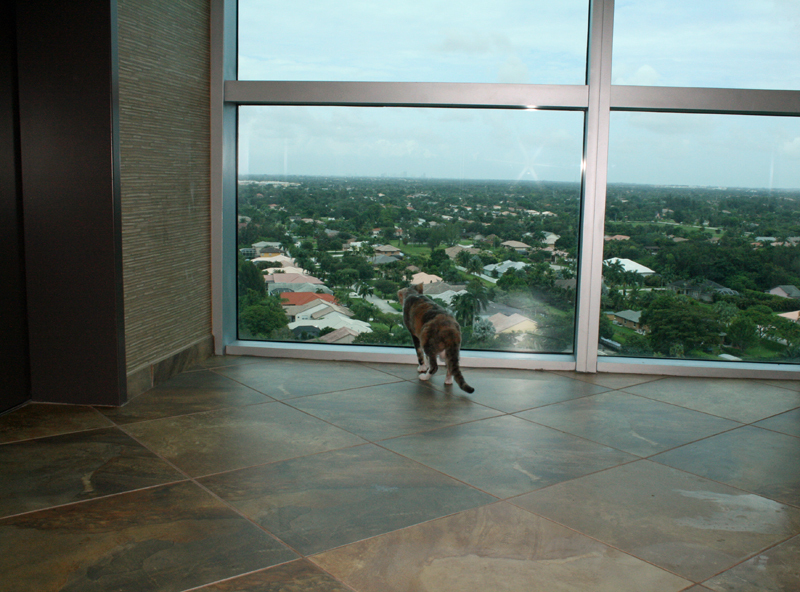 Daisy, even your lobby has a great view! Very nice! Oh, Daisy! I think you better stick to strollering around the condo, honey pie! That looks a little bit askeery! Wow, an elevator! I would only go with my Mom to help me. Daisy, please don't do that. You are making us nervous. You are brave to go out exploring on your own Daisy. Exploring is fun, but I definitely wouldn't do it by yourself. You have some adventures ahead, I believe. You are very brave, Daisy. Have you met any of the neighbors on your excursions? If you figure out the elevator, you can go get chik-hen! That was nice of Mommy to let you do that. I suspect Harley will have to wait till he is a bit more mature and well behaved. Can you go with a harness perhaps? In case somebody comes up in the elevator. That looked like a fun adventure. Well aren't you the brave one. We moved to an apartment a year ago and neither of my kitties have ventured further than just outside the apartment door! How freaked were you that she would get away? I know she can work the elevator buttons. 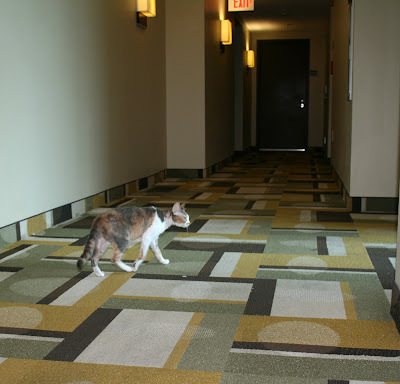 You and Harley can run races up and down the hall! Miss D., you are so sophisticated! Look at you all calmly exploring your new building. If you aren't careful, someone is going to grab your credit card and go to the mall and go shopping! Wow Daisy! 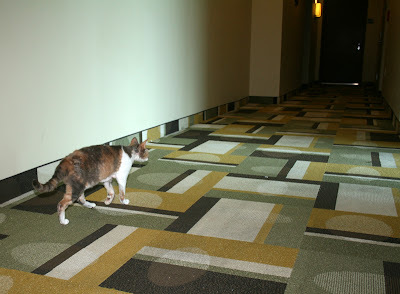 You are one brave cat to go wandering around like that! Wow, you found a nice view! 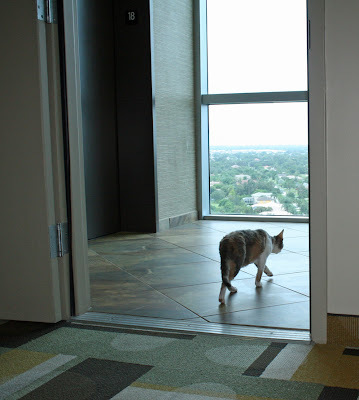 But I think you're right about the elevator... Leave that for the humans! 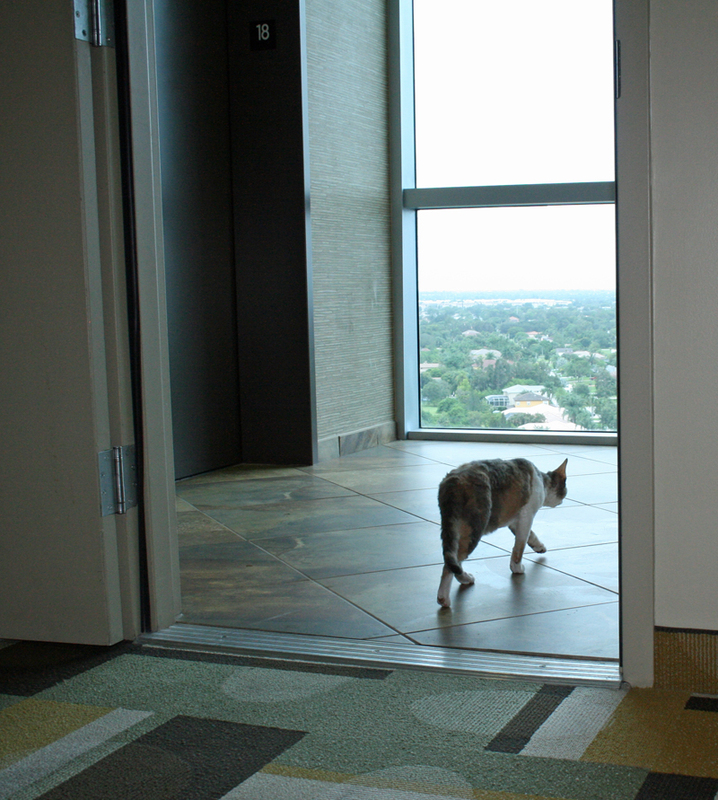 You are right about the elevator, Daisy, just continue with the exploring the nice view! daisy...yur lobby iz awesum, knot onlee can ya play twister on de floor but tic tac N toe two...draw smiley facez...make bee leeve piez...werd bubbles !!! What a brave little explorer! Hopefully you didn't scare your mom too much. Be careful, Daisy. Don't get lost! Daisy, you're gonna have a lot more exploring to do! 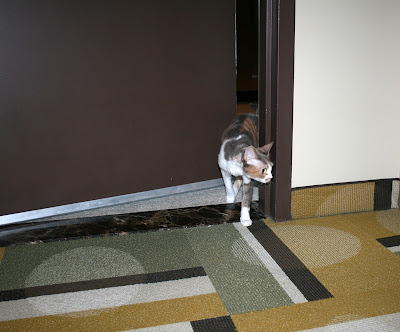 Oh my goodness Daisy...don't get on the elevator! You might get lost!! I know your Mommeh was with you. 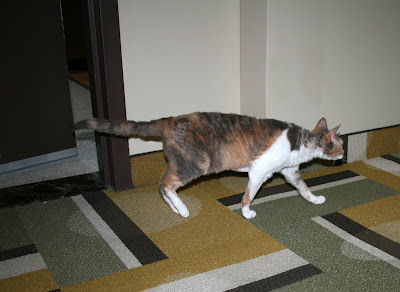 Daisy, quite frankly, we would NOT EVEN WALK on carpet like THAT! Allie: "Holy CAT! DAISY!! Wait for me! SHOPPING SPREE!!! WHeeee!"